Help Sudoku is a simple tool to help you solve sudokus. Enter the numbers you know and Help Sudoku keeps track of your progress as you go. If you get stuck, you can ask for a hint and Help Sudoku will show you whichever cell you ask for. Otherwise, you carry on solving the sudoku yourself using your own techniques and Help Sudoku won’t say anything, unless you make a mistake. 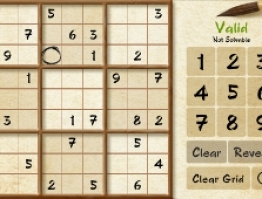 Unlike most sudoku games available online and on mobile devices, Help Sudoku uses only traditional sudoku-solving methods, not brute-force search (i.e. trial and error), so when Help Sudoku tells you that a sudoku is Solvable, that means it has a single solution that you can arrive at using traditional methods, without guessing. Start by filling in the numbers that are given. When you’ve done this, you should see Solvable in the indicator next to the grid. If it still says Not Solvable, check the numbers carefully as you’ve probably made a mistake! If you’re sure the numbers you’ve entered are correct, and the sudoku still shows as Not solvable, read the 'What if Help Sudoku says my puzzle is not solvable?' section below. 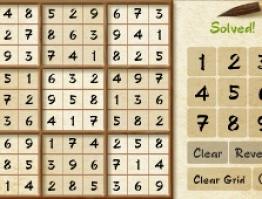 Solve the sudoku using your usual methods and fill in each number as you solve it. If you make a mistake the indicator will change to Invalid. That means the last number you’ve entered is wrong and you should correct it before continuing. If at any point you get stuck, select the cell you’re stuck on - or any blank cell - and click Reveal. Help Sudoku will fill in that cell for you with the correct number. This should get you going again. right-hand side. If you want to clear a cell you’ve already filled in, click Clear. You can clear the whole grid by clicking Clear Grid. 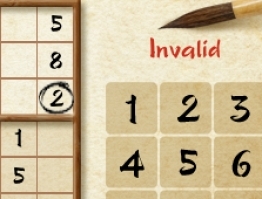 What if Help Sudoku says my puzzle is not solvable? For a few extremely difficult sudokus (for example, around 2% of puzzles classified as ‘Fiendish’ in the Times), Help Sudoku will tell you the sudoku is Not solvable after you’ve entered all the given numbers. In these cases you need to provide one more number to make the puzzle solvable. To do this, select a blank cell - the central cell is a good one for this - and try all nine numbers. Only one will make the indicator change to Solvable; the other eight will produce Invalid.